Save $110 off regular price! 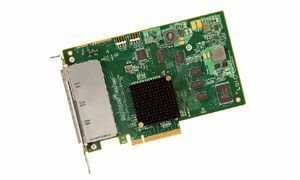 The LSI SAS 9201-16e host bus adapter enables large-scale storage arrays through 16 high-speed 6Gb/s ports, supporting up to 1024 SATA and SAS physical devices. This HBA bolsters large capacity external server storage RAID and non-RAID enclosures by pairing an x8 PCI Express 2.0 host interface with four external x4 SFF8088 Mini-SAS connectors. LSI SATA+SAS HBAs are compatible with 6Gb/s and 3Gb/s, SATA and SAS, hard disk drives, solid state drives, and tape drives.